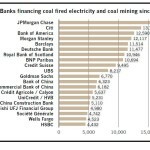 Limiting coal finance good; phasing it out, absolutely vital! MEXICO CITY. Potential carbon dioxide (CO2) emissions are stored not only underground in the form of fossil fuels, but are also inherent in existing energy sector infrastructure, particularly in power generation infrastructure. According to the International Energy Agency (IEA, 2012), energy infrastructure currently in place and under construction will emit, under normal use by 2035, up to 81% of the permissible carbon budget that would limit global warming to 1.5°C or lower. Among all sectors, the energy sector is the largest greenhouse gas polluter. By far, coal-fired power generation is its largest contributor. In 2010, coal was responsible for over 43% of global CO2 emissions (IEA, 2012). Emissions from coal based electricity generation infrastructure are locked in for many years, 35 to 40 years at least. Then, to prevent dangerous climate change, current and under construction coal-fired power capacity must be prematurely retired or remain idle. Cutting off coal burning is the most effective way to limit environmentally harmful CO2 emissions being pumped by the energy sector. To this end, support for CO2 intensive electricity generation must be eliminated and strengthened towards lower-emissions energy sources. Since 1994, public financial institutions have supported 156 coal power projects worldwide (WRI, 2012). This is translated in over USD 37 bn in dirty electricity financing. During this period, multilateral development bank (MDB) financing accounted for a 36% share of the total public funding allocated to coal. The World Bank Group (WBG) has been the largest MDB providing money to coal projects: over USD 5.3 bn by 2012 (Figure 1). Recently, the WBG has released its Energy Sector Directions Paper (2013), which sets principles-based course for the Bank Group’s work in the energy sector with a focus on expanding energy access and sustainable energy. Overall, WBG’s new energy strategy aims a mirroring United Nation’s vision towards achieving sustainable energy for all; that is, achieving universal energy access, improving energy efficiency, and increasing the use of renewable energy. Following WBG’s first move, the European Investment Bank (EIB) has recently announced the adoption of new guidelines to reinforce support for investment in sustainable, clean and smart energy and to screen out investments whose carbon emissions exceed a specific performance standard. With this announcement, the EIB, the world largest public financial institution, reinforces its commitment to follow EU energy and climate change policy and clean energy national strategies by ending support to coal-fired projects, which is estimated in USD 2.5 bn since 1994. Without a doubt the WBG and the EIB have taken a first lead among MDB’s towards ending financial reward for environmental and human harm caused by coal-fired power projects. However, this can only been seen as a good first start. WBG and EIB coal financing represents 80% of total MDBs support to the sector, estimated in USD 13.4 bn by 2011. Other players have to follow WBG intentions, specially the Asian Development Bank (ADB) and the European Bank for Reconstruction and Development (EBRD); together, they have funded at least 30 coal projects with an approximate financing pot of USD 4.8 bn since 1994. WBG and EIB´s lead towards securing sustainable energy for all is something to cheer up. Nonetheless, to end with CO2 emissions from coal-fired power generation, once and for all, limiting finance of power plants to “rare circumstances” or “emissions tresholds” will not be sufficient. 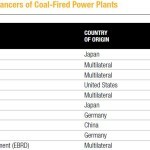 The vast majority of polluting coal plants in the world have and are still being built with private sector finance. As a study by Profundo (2011) revealed, the world’s largest commercial banks continue to invest significantly in all streams of the coal industry value chain, from mining to coal-fired plants. Just in five years (2005-2011), private coal financing from top 5 commercial banks amounted 5 times the coal financing support of all MDBs since 1994 (Figure 2). 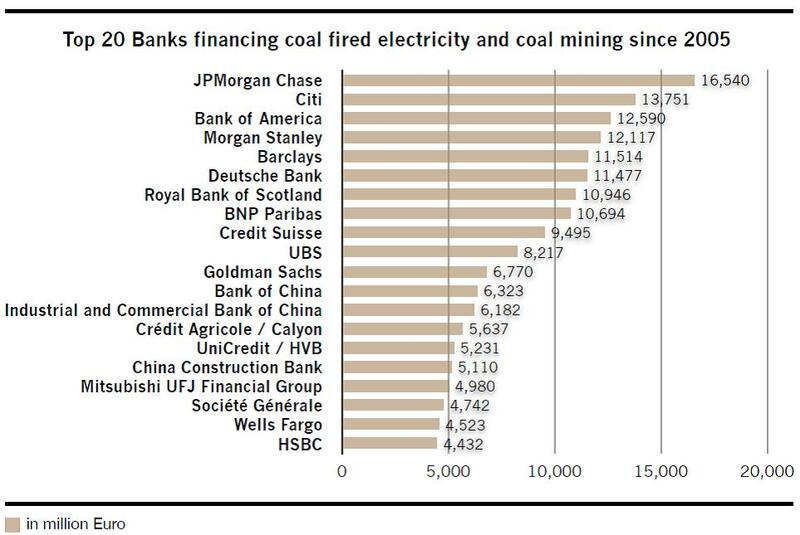 Figure 2: Top 20 Banks financing coal fired electricity and coal mining since 2005. Source: Profundo (2011). To overcome the carbon lock-in in which our energy system infrastructure is imprisoned, for the public interest, no public money should finance the deterioration of global commons by climate change. Financial institutions and governments worldwide need to act immediately in phasing out investments in all fossil fuels; no more carbon intensive infrastructure can be built. MDBs, as well as major coal investors such as commercial banks, have to stop putting money into dirty coal and start allocating capital funding to cleaner and sustainable sources of energy (e.g. solar, wind, geothermal, sustainable biomass, etc.) and to more intelligent and efficient use of energy (e.g. energy efficiency measures, smart grids, sustainable energy infrastructure, etc.). The only way to achieve the sustainable energy for all action taken by the UN, to “secure the affordable, reliable, and sustainable energy supply needed to end extreme poverty and promote shared prosperity”, the aligned WBG and EIB’s intentions have to be backed up with subsequent commitments and tangible actions by all relevant financial actors. The WBG and EIB’s new energy investment strategy suggests that unlocking carbon intensity of world’s energy sector infrastructure is possible if there is the financial willingness to do so. The WBG and EIB have to envision and work for their intentions to deliver further. Their main challenge is to lead and make other public and private investors to follow and make this happening. Limiting coal finance is good; phasing it out, absolutely vital.